If you have ever worked in an IT department or lab, you have probably noticed that the 51/49 male/female ratio promised by birth statistics doesn’t quite hold up at this point. Often cited reason is that girls’ academic accomplishments have fallen behind the boys’ in all major STEM subjects. When joking about girls being incapable of doing math is socially acceptable, it can become a self-fulfilling prophecy. 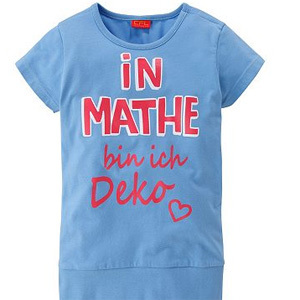 (A European clothing chain thought it was okay to head this year's Spring Collection with T-Shirts proclaiming “In math I am just decoration” and "Allergic to Math"). Interestingly enough, it seems girls are resilient against these types of smear campaigns and stereotypes. A recent study found that the problem is not so much that girls and young women don’t excel in STEM fields, but rather that they choose not to pursue them. So how do we ensure that girls are not only good in science, but enthusiastic about it? Some researchers think that combining storytelling and science might be the way. Cue in Goldieblox - winner of the most recent Parents' Choice Gold Award. I first came across this gem of a toy last year when it had just completed its first round of kickstarter funding. Goldieblox is a construction toy that teaches engineering principles by combining pegboard, axles, wheels and cranks with a story book about Goldie (a girl with a tool belt) inventing a spinning machine for her friends. I ordered a set before there was a firm delivery date and waited 5 months. It was worth the wait. Besides being an adorable story, it guides children through the process of inventing, which means building, failing (! ), investigating errors and rebuilding. In addition to the set built following the story, there are many other building suggestions in the book. For more advanced engineers there is also space to draw their own designs.